Image from “Hitler’s War Against the Jews” (1975) by Lucy Dawidowicz, p. 61. I am starting to write this blog on Thursday, November 10th. 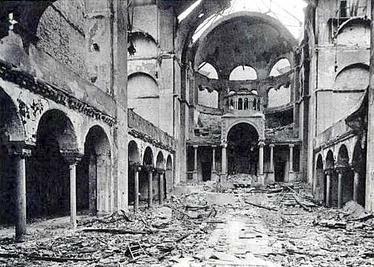 Today is a commemoration of Kristallnacht (November 9 – 10, 1938), the infamous night of violence that preceded the Nazi atrocities during the Holocaust. I am also going today to the funeral of an old and dear family member who passed away a few days ago. He will be buried in Mount Hebron Cemetery in Queens, NY, a place that also holds the grave of Raphael Lemkin: the man credited with coining the term genocide. The Webster Dictionary defines genocide as “the deliberate and systematic destruction of racial, political or cultural groups.” There is no question that the Holocaust was a genocide. Genocides do not repeat themselves exactly. They come in different guises. Despite the deniers, it is straightforward to teach students to condemn the Holocaust, but it is more difficult to teach them how to prevent future genocides. One of the most difficult parts is to see them coming. Despite the fact that Hitler published the first volume of his manifesto, Mein Kampf, in 1925, where he laid out his philosophy, he was, nevertheless, democratically elected as German Chancellor in 1933. Few people believed in 1933 that he would seriously try to accomplish what he preached or anticipated the consequences that resulted from his actions. Predictions by the Intergovernmental Plan on Climate Change (IPCC) and most scientists, strongly suggest that we may be creating our next genocide ourselves; a “business as usual” scenario over the next 70 years (the expected lifespan of my grandchildren – my definition of “Now” in my book) will result in doubling of greenhouse gas emissions. Emissions at these levels would result in major extinctions around the globe, with more than 40% of ecosystems destroyed. The belief that we are not part of the ecosystems is a dangerous hubris. We have just passed the 7 billion population mark and even if we take the 40% prediction with a large grain of salt, we are talking about the potential genocide of billions of people. As it stands now, climate change is not a genocide; nor is it a crime against humanity, much less inherently evil – but it has the prospect to be all three. That said, as decided at the Nuremburg trials, you don’t punish a possibility, no matter how dire. You try to change the outcome via education and other resources (Holocaust Remembrance Day). I am certainly not trying to compare Donald Trump to Adolf Hitler or to argue that a repeat of a short-term genocide of any sort is coming. As I’ve said repeatedly, though, in the lHowever, in my opinion, Trump’s election – along with the resurgence of nationalistic, xenophobic, anti-globalization, anti-immigrant, anti-trade movements in many parts of the world is an early sign of the Anthropocene (June 14, 2016). I posted the ruined Berlin synagogue above because I fear that violence will start to raise its ugly head once it becomes obvious that the actual implementations of Trump’s promised changes to “Make America Great Again” are not necessarily welcome. There are still absentee votes being tallied but as it stands, Hillary gathered 61.04 million individual votes and 228 electoral votes, while Trump won 60.37 million individual votes and 290 electoral votes. Hillary’s win of the popular vote amounted to a margin of more than ½ million votes – a margin that seems to be drifting ever-wider. Interestingly, while Hillary’s plurality was larger than that of Al Gore in 2000, Richard Nixon in 1968, and John F. Kennedy in 1960, she and Al Gore lost the presidency but both Nixon and Kennedy won their respective elections. According to the US Elections Project, only 133 million of the close to 232 million eligible voters actually voted. This amounts to 57.6% participation. That’s about 3% higher than the 2012 election (see my post on March 29, 2016) but it still means that almost 100 million eligible voters that didn’t give enough of a damn to exercise that right. The turnout in Pennsylvania was 61.1% (6 of the 9.7 million) and in Florida it was 65.1% (9.5 out of 14.6 million). Trump won Pennsylvania by 68,000 votes and Florida by 119,770 votes – numbers that would essentially equate to a tie within a margin of error. Based on these numbers, my take on the voting pattern in the November election was that three major groups were in competition: the Republicans with Donald Trump as their candidate, the Democrats with Hillary Clinton as their candidate and the “don’t-give-a-damn” (DGAD) group: sort of a resurrection of the “Know-Nothing” party from the mid-19th century, with some obvious differences. The DGAD group clearly won a convincing plurality by doing nothing but by refusing to actively shape the government, they shifted that honor to the two other parties. Given that the Democrats and Republicans were basically tied, this meant electing a president, Congress and indirectly the Supreme Court by tossing a coin following constitutional rules. The Republicans won. I am an old guy but I’m far from the only one to believe that these elections were probably the most consequential within my lifetime. As I have discussed repeatedly, we are in a global transition into a new era dominated by humans. Climate change is an early sign of this shift. Such a transition implies a conflict between the collective and the individual. We are electing governments that must take cooperative actions. In democratic societies, voters have an active say in this representation. People all over the word are trying to balance their own perceived needs with the collective actions necessary for human survival as a whole. I wrote before that teaching for the Anthropocene (June 7, 2016) presents major challenges. What these elections, and the large “participation” of the DGAD group tell us is that we must change the emphasis from teaching to learning. Michelle Obama’s often quoted dictum of, “When they go low, we go high,” doesn’t work very well. Most people are not equipped to take the higher ground. They can connect much more easily with the lower rhetoric and tactics. Election campaigns like that we just witnessed provide teaching opportunities, while the election results act as tests of whether the electorate has learned those lessons. Well, we flunked! We will have to try harder next time. Politics is first and foremost the art of story-telling and image, and those who would replace Netanyahu need to be more radical and more thuggish than Netanyahu himself. Given the current political climate worldwide, his “advice” seems to apply to politicians across the globe, regardless of their political leanings. It is this so-called lesson that we must learn to fight against. In the meantime we will live with what we got. My own advice to the Republicans: First, do no harm! Now that you are (or will soon be) in charge of all three branches of government, tread carefully. Don’t destroy something before you learn why it was constructed in the first place and have a well-researched alternative ready as a replacement. I just fear that many of the above commitments cannot and will not be delivered upon and may result in major disappointment for the people who voted for him in the name of change. Disappointment easily descends into violence, which is usually directed at some of the most vulnerable segments of the population. As we have seen from historical precedence, the violence can be directed internally and externally. In both cases the results can be catastrophic to everybody. Please tread carefully! This entry was posted in Anthropogenic, Climate Change, Election and tagged Anthropocene, Anthropogenic, anti-immigrant, apathy, Berlin, business as usual, campaign, Climate Change, Climate Change Denial, Climate Change Deniers, Climate Skeptics, Clinton, Congress, Democrat, democratic, Democratization, DGAD, Donald Trump, Economics, Education, Election, electoral college, electoral system, electoral vote, Environment, Florida, Fossil Fuels, Genocide, Gore, Hillary, Hillary Clinton, Hitler, Holocaust, individual vote, Kennedy, Kristallnacht, Mitigation, nationalist, Nazi, Netanyahu, Nixon, non-voter, nonvoter, Nuremburg, Pennsylvania, political, politics, poll, popular vote, Raphael Lemkin, Republican, Science, suicide, Supreme Court, Trump, US, Violence, vote, voter, Voting, xenophobe, xenophobia, xenophobic. Bookmark the permalink. These results make sense given the rise in hate crimes against minorities in the days after Trump’s election and the recent appointment of Stephen Bannon as Trump’s chief advisor. Mr. Bannon is a known white supremacist, racist, anti-Semite, and Islamophobic agent. Instead of telling Trump supporters to “tread carefully”, we should shed light on the injustice of their support for such a candidate given his vitriolic rhetoric and proposed policies.